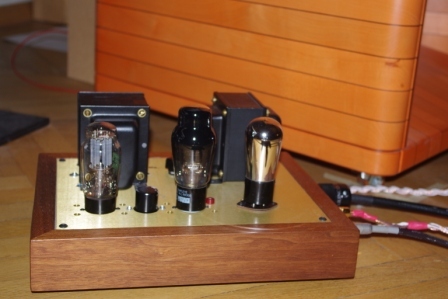 January 2015 - The Rise of the "Moondogs"
My love for SET amps, and directly-heated triodes (DHTs) in the output stage in particular, started years ago, when I decided to build my first amplifier, the Welborne Labs Moondog 2A3 monos in kit version. See my article from 2005 on this website for a description of how and why this happened. The Moondogs were quite sensitive/high gain SET amps as they used two indirectly-heated 6SN7 double triodes (just one half of each per mono bloc) in a cascade implementation as drivers. The design of the amps was nothing really special, but the parts quality was excellent and the looks of the amps/the finish of chassis and wooden-cabinet frame were superb. I was immediately in love with how the amps looked and also liked the name Ron Welborne chose for the mono-bloc amps. ;-) That Ron Welborne offered these beauties also as kit version for a really fair price was another bonus for me. It's worth mentioning that Ron Welborne was at that time one of the few audio dealers in the US who promoted single-ended amplifier designs and was one of the "fathers" of bringing back this SET amplifier magic to the broad audio public in the US and also Europe. 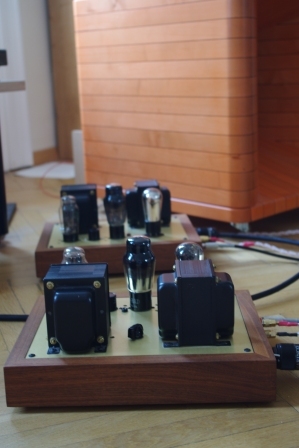 Only in Japan, SET amplifiers were then quite popular and widely used within Japanese audio circles. The original Moondogs had a capacitor input power supply with choke and tube rectification. Driver tubes and the 2A3 output tube were implemented in cathode-bias mode (i.e. with cathode bias resistor and by-pass cap) plus Jensen coupling caps between driver and output stage. 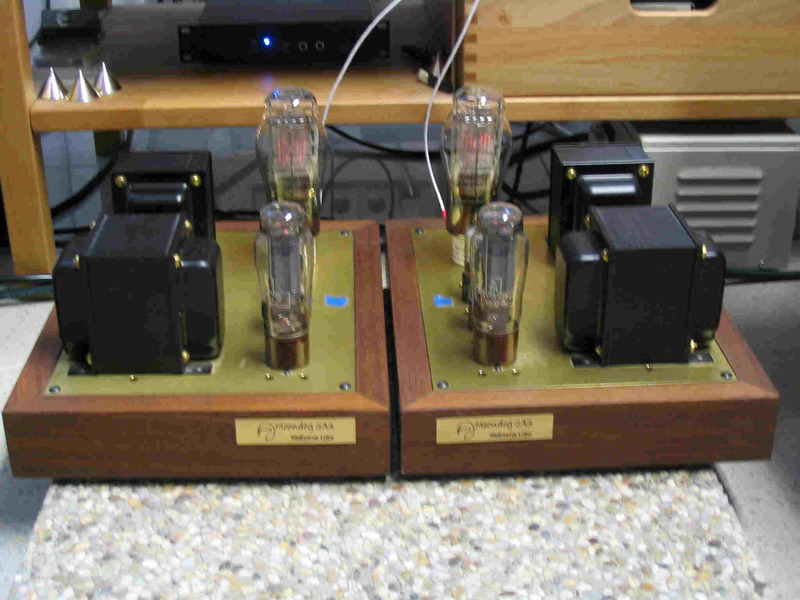 The output transformers (OPTs) used were a pair of nice 3k primary Electraprint designs (made by famous audio veteran Jack Elliano) with 4, 8 and 16 Ohm secondary taps to choose from. I used them wired to the 8 Ohm tap. At that time, I had the right speakers (Altec Lansing Model 15) from my beloved, late father at hand, which were fine for the Moondogs to let me learn about the DHTs sound flavor. And this sound flavor completely got me hooked. :-) DHT SE amps, have in my opinion, what I always had been looking for in reproducing music at home: They deliver the intimacy, tone and emotional impact of the recorded performance. Of course, I also liked the idea of being able to build my own amps - who wouldn't like that! ;-) Due to the accurate manual Mr. Welborne offered with his amplifier kits, also a novice in soldering and know-how of amplifier designs like me, could do it. Although it took me way longer than stated in the manual to finish my 2A3 monos, they worked fine from the first time switching them on! And, to me, they were a great match with the Altec Lansing Model 15 speakers :-). I thoroughly enjoyed listening to music with my Moondog 2A3 amps. Then, as is often the case when you make the "right" decision for yourself, my personal journey and development of knowledge on my path to musical joy with my audio system went quite well. 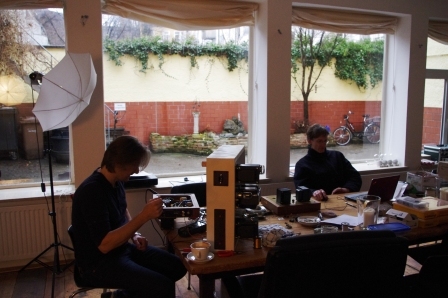 I met and became friends with DIY tube experts, such as Joe Aigner, who introduced me to his style of tube amp building - with a lot of iron, he is a friend of Thomas Mayer ;-) - which was a lot more refined and advanced due to his many years of experience of designing his own tube amps. I learned about the various flavors of how DHT tubes can sound in different implementations. His excellent-sounding 801A SE amp is a great example. I also heard for the first time the power of a 211 SE amp at Joe's place, which was quite enlightening for me; I heard that his designs were a lot quieter than my Moondog 2A3 monos, mainly due to his more advanced power supply designs and the use of a lot of iron. In the meantime, Thomas Mayer decided to start building amps commercially and I fell in love with his designs, especially with his 801A SE Amp, which I finally bought and am still proud to own. This amp outclassed my 2A3 Moondogs as well as my clone 300B WE91 mono-bloc amps (the ones sold by DIY Hifi Supply, Hong Kong) sound-wise by quite a margin, but I still loved the tone of the 2A3 tube. It is such a seductive sounding DHT tube and my Moondogs were, as mono-bloc amps, so neat and light compared to Thomas' "big and heavy" but beautiful-looking and sounding 801A SE amp! So, when Christoph explained to me where, in his opinion, the possibilities of improvement to my already fine sounding 2A3 mono bloc amps would lie (for example the high sensitivity of the amps due to the two driver gain stages) and that with the existing iron (OPT, Choke and power transformer) and modifications in the design of the amps to a more "old school" approach plus some changes in parts, which he believes make a difference in sound, really good 2A3 monos could be the result. I was immediately hooked. As an unexpected bonus, he offered to make these modifications for me, if time weren't too important. Wow, that was too good to be true! And it became reality. 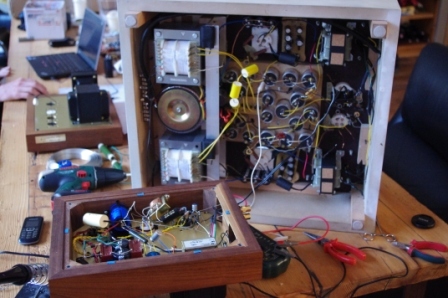 ;-) About a year ago, he finished his rework of the 2A3 "Moondog" amp design. It was now a 2-stage amp design and, therefore, parts count had been reduced. 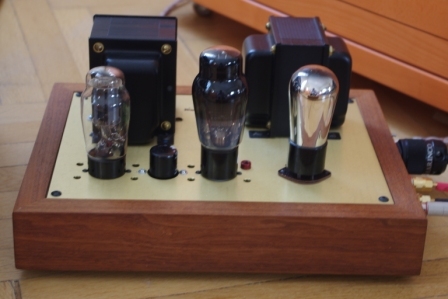 The input/driver tube of choice was the beautiful 6C8G, an indirectly-heated double triode Christoph loves for its tone (this is a predecessor of the well-known 6SL7 double triode). He used one half of the 6C8G and a grid choke (instead of the grid resistor). Modifications to the power supply led to a lower value in the input capacitor and the change from Mullard GZ37 to a Philips 5V4G tube rectifier as the 5V4G provides a lower voltage drop. The ps was further modified by replacing the original ps caps (Elna Cerafine plus some Solen caps) with one 600uf Fischer and Tausche electrolyt cap. In addition, I invested in a pair of 0,22uf Duelund Cast Copper capacitors for coupling of the driver to the output tube. When Christoph left me his 6B4G monos for comparison with my 2A3 monos, I didn't know what to expect. The 6B4G is a 2A3 DHT with a 6,3V heater and due to not being as well known as its famous sister, still available in NOS qualities for a very good price. Christoph runs the 12SJ7 pentode as input/driver tube in the 6B4G amps with stabilized G2 voltage and the 6B4G in fixed bias mode (the negative grid voltage is now provided by batteries omitting the cathode resistor and bypass cap) with a specially selected copper foil coupling cap between driver and output stage. And although he substituted the rectifier tube in the ps to a solid state rectification with multiple RC filters - I can hear all the die-hard tube fans now scream ;-) - the music reproduced with the 6B4G amps had more flow and speed than through my already wonderful 2A3 monos. This was especially apparent in the bass reproduction. I haven't heard a faster and more well defined bass performance from a low powered SET amp so far. Thomas Mayer's excellent sounding 801 DHT SE amp - although with more weight in the bass - was slower and delivered bass a bit too "boomy" in comparison. Discussing these results with Christoph confirmed his preference to run driver tubes or, in his opinion, even better, output tubes with the fixed bias method. Apparently, leaving the cathode resistor and bias cap out in the output stage of an amplifier and providing the necessary negative DC grid voltage by using the means of batteries or another appropriate DC voltage source seems to have advantages. Due to the reduced parts count, part quality and part selection becomes more important than ever for the musical qualities of an amplifier. And in the art of choosing the best matching parts, audio design "Maître de Cuisine" Christoph has over the years developed fantastic skills. :-) This he proves with every new amp design! 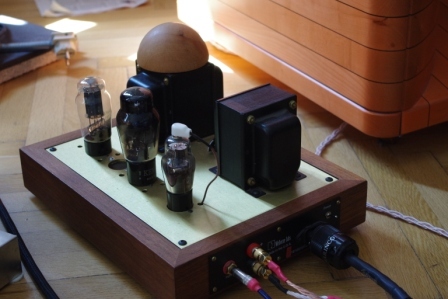 But there is another factor Christoph highly values regarding developing a truly musical tube amp. It is the right pair of speakers, which are able to reproduce all of the dynamics as well as nuances and shadings of recorded music; this lets him hear if his tube-amp design implementation and parts selection delivers the aimed for results. 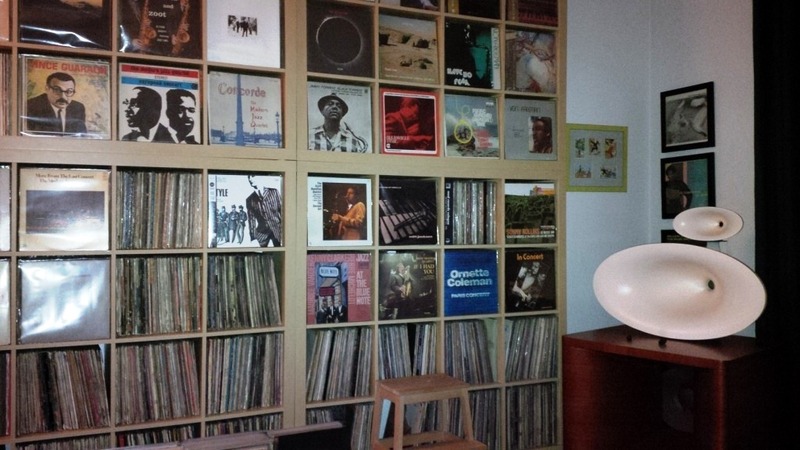 In David Haigner's ETF horn loudspeaker, he found the perfect mates for this job! And since then, Christoph's excitement in building tube amps and coming up with further enhanced tube amp designs has grown vastly. As the results of the 6B4G were so promising, Christoph suggested that I live with these amps for a while and he would take my 2A3 "Moonies" and will try his "fixed-bias" magic with them, too. After some months and some experiments with selecting the best fitting driver tube for my 2A3 monos, he called one evening very excited to say that he had found the perfect driver tube in another DHT tube, the vintage 112A (a directly-heated triode from the 1920!). He really loved the musical qualities of this DHT pairing when he tested the amps in his system. According to him, these were not only extremely musical amps; these 2A3 amps now also had speed, dynamic qualities and bass power. In addition, although the gain of the amps had been reduced on paper to a 1/4 due to the switch from the cathode-biased 6C8G driver to the cathode-biased 112A, one didn't feel this change in the same magnitude as the gain loss on paper would indicate. Christoph found that an active preamp with 6 to 9db of gain was now the optimum partner for the reworked 2A3 amps. My friend apparently had turned my amps into fully DHT driven musical machines. This was too good to be true and I was longing to hear my new amps in my system! 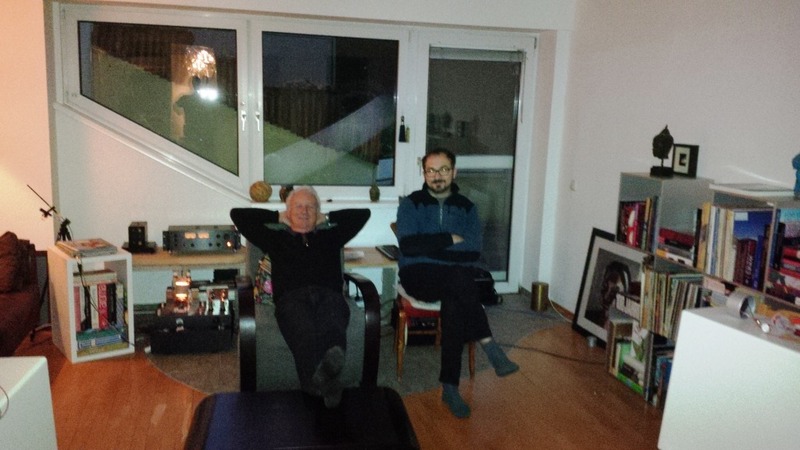 Finally, in early December Christoph visited me for an audio session together with two of our Bavarian friends and audio experts, Wolfgang Braun and Gerald Gessner. We had a blast over that weekend as David, Alexander and Alex also joined listening at my place. We also had a great time listening to music at Alexander's and David's homes. Thank you, friends! Christoph did it again and DHT tubes definitely rule!